Gov. Dannel P. Malloy renewed a fight with organized labor Wednesday by vetoing legislation sought by teachers’ unions that would have set a statutory requirement that state education commissioners have a strong classroom background, a standard not met by his first commissioner, Stefan Pryor. Mark Waxenberg, the executive director of the state’s largest teachers’ union, the Connecticut Education Association, said he was “stunned” to hear Wednesday that Malloy was vetoing a bill that addressed a conflict that nearly derailed the Democratic governor’s relationship with an important labor constituency during the 2014 election. AFT-Connecticut’s new president, Jan Hochadel, who took office Wednesday, expressed disappointment, while praising Malloy’s choice of an experienced educator, Dianna Wentzell, as Pryor’s successor. Malloy said that the legislature has ample ability to weigh in on the governors’ selection through the confirmation process. 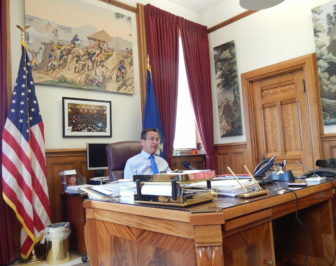 “The legislature has the right to reject any candidate nominated by the governor that they do not feel possesses the appropriate qualifications and experience,” Malloy wrote. Under the bill, the governor and the State Board of Education would have had to choose an education chief with a minimum of five years of classroom experience and three years of school administration. The bill was approved unanimously by the state Senate and by the House on a vote of 138 to 5. Malloy’s first education commissioner, Pryor, riled the state’s teachers and their unions during Malloy’s first term by proposing several reforms to teacher tenure and collective bargaining rights in the state’s lowest-performing schools. During last year’s gubernatorial election campaign, the state chapter of the American Federation of Teachers endorsed the Democratic governor after their members passed a resolution demanding future education commissioners have a significant background in teaching and administration. The Connecticut AFL-CIO passed a similar resolution on the same day it endorsed Malloy. Pryor’s background was in economic development, and he accepted an economic development job in Rhode Island after stepping down as commissioner. His education credential was that he helped open one of the state’s first charter schools. Malloy listened to the teachers’ complaints, announcing in April his choice of Wentzell, who has decades of experience in schools as a teacher and administrator. “I made it clear that we were looking from day one for someone who has been a teacher,” Malloy said. When vetoing the bill, the governor said that had this become law Connecticut would have more stringent requirements for this position that nearly every state. Allan Taylor, the chairman of the State Board of Education, said flexibility was important. Rep. Andy Fleischmann, D-West Hartford, who was a chief sponsor of the bill as the co-chair of the Education Committee, said the concerns raised in the veto message were ones expressed to him after the bill was unanimously approved by his committee. “I didn’t find them very persuasive then, and I don’t find them persuasive now,” Fleischmann said. Republican leaders also were critical. “The governor made education experience a priority when searching for his new commissioner, after distancing himself from a previous controversial choice. So why reject a bipartisan effort to ensure that education experience is always a priority?” said Sen. Minority Leader Len Fasano, R-North Haven. The Democrat-controlled legislature has yet to override a veto by the Democratic governor, and Fleischmann was uncertain if this bill would become the first. The veto was one of four announced Wednesday. Two others involved schools: One would have set minimum staffing requirements for school nurses; the other would have required school systems to report special-education expenditures per child. Malloy’s veto message called the latter bill a potential violation of the Family Education Rights Privacy Act. His message on the nursing bill said it required a staffing level of one nurse for every 750 students but also created a waiver system that undermined the measure. The governor now has signed 175 bills and vetoed eight. The administration also announced Wednesday that Malloy signed a wide-ranging, controversial health care bill. It imposes new rules for the approval process of changes in hospital ownership, bans or limits certain medical billing practices, calls for the creation of a statewide system for sharing patients’ electronic medical records and establishes new requirements aimed at helping patients learn the cost of health care in advance. The measure was inspired by concerns among some legislators about the growth of large health systems that control multiple hospitals and physician practices. Hospital officials opposed it, while patient advocates and unions praised it.